Last week's Monday Map showed the rainy day fund balances in each state prior to the beginning of the recession in 2007. This week, we take a look at these rates for fiscal year 2013, and note some interesting changes that have taken place. In terms of improvement, Alaska continued to grow its rainy day fund and now has a balance equal to 211.16% of its annual general fund spending. Wyoming also improved from its 5th place ranking in 2007 with a rate of 12.73% to a 3rd place ranking in 2013 with a rate of 53.13%, and West Virginia moved from 4th place to 3rd place by increasing its rate from 13.59% to 20.91%. Perhaps the most notable jump came from the Lone Star State; Texas jumped from 40th place in 2007 with a rate of 1.07% to 4th place in 2013 with a rate of 18.58%. 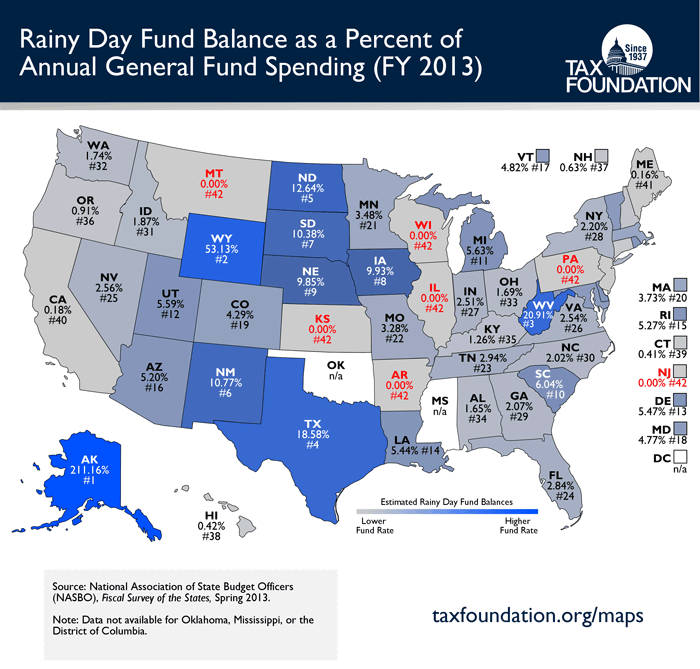 In 2013, only Alaska, Wyoming, West Virginia, and Texas maintained rainy day fund balance rates above the estimated 18% safety zone (see last year's study for details). However, many states are moving in the right direction. For instance, Michigan went from having a rate of 0.02% in 2007—the lowest ranking state aside from those with rates of zero—to the 11th best rate in the country at 5.63%. Colorado went from having a rate of 0.00% to a 19th place ranking at 4.29%. Also, South Carolina went from 34th at 2.56% to 10th at 6.04%. Although these rates are a far cry from 18% and fall below even the lower end of the spectrum of expected revenue shortfalls during an economic downturn (13%), they are nevertheless a significant improvement from 6 years ago. Unfortunately, some states’ fund balances are looking a bit worse for the wear. Albeit small, New Jersey nevertheless had a rate of 1.64% in 2007, but joins 6 other states with a rate of 0.00% in 2013. Wisconsin has also fallen into this group since 2007, along with Pennsylvania (the others are Montana, Illinois, Kansas, and Arkansas).